Bhumi Pednekar, was last seen in her debut movie Dum Laga Ke Haisha as an overweight woman. However, she has just stunned everyone with her new avatar during the film promotion with her co-star Ayushmann Khurrana. It was a complete changeover from how she appeared in the movie. Bhumi Pednekar has lost around 21 Kgs in a span of 4 months by following a special diet program that doesn’t require her to starve in order to lose weight. Interestingly, she didn’t opt for any medical surgeries to achieve her goal of losing weight. When she was asked to play the character of Sandhya in the movie ‘Dum Laga Ke Haisha’, Bhumi immediately jumped on to look realistic (apt) in her new avatar. She ate a high calorie Pizza for breakfast and also regularly ate dal makhni, butter chicken, mughali dishes & mithai during her meals. While at the time of starting the film shooting, Bhumi Pednekar gained 90 Kgs of weight. Earlier, she was 72 kgs. Considering her height, which is 5 ft 6 inches, she is regarded as an obese woman. Once her shooting part has been wrapped up, Bhumi has decided herself to lose all the gained weight so that she won’t be missing any future film chances because of her overweight personality and also due to health concerns. In just a span of 4 months, she lost a whooping 21 Kgs and stunned everyone while she attended the promotions of the movie. Interestingly, Bhumi Pednekar admits that putting extra kilos to play the character wasn’t a big challenge because she’ve been overweight since her childhood as she is fond of food. Despite playing badminton and volleyball, Bhumi looked a bit fat due to her love for food. Note: Bhumi Pednekar used to consume more than 3000 calories a day to gain weight. Also read how Sonakshi Sinha, Adnan Sami and Sonam Kapoor lost oodles of weight before becoming the biggest stars in Bollywood. Even Alia Bhatt lost 16 kgs in 3 months before her debut into the films. Bhumi Pednekar diet regime doesn’t pose any risk as she followed a completely natural way of losing the weight, without any restrictions like starving. In order to lose weight, Bhumi never deprived herself by eating anything that she wanted. She simply made a few changes to her diet regime by selecting fat-free versions of her favorite food over high calorie versions. Below is the sample diet plan followed by Bhumi to lose weight. Dinner: Lots of greens (vegetables) and if bored, she would make a smoothie out of the veggies. Whenever she is hungry, she has a bowl of dal and also sips on a detox drink (cucumber, lemon and mint in water). Bhumi says that white food is not at all good for losing weight and considers the brown variants such as rajgira and multi-grain rotis. Instead of regular oils, she prefers Olive oil whenever she wants to eat fried stuff. And the most important of all, she used to guzzle liters of aloe vera juice 5 times a week and lots of green tea and kale juice, which actually helped her in detoxifying her body. Surprisingly, she did all this without consulting a dietician or a nutritionist. It was only Bhumi and her mother who jointly came up with this diet plan. But, now after losing a lot of weight, she was taking the help of a professional so that her body can look curvy. In order to lose weight, diet alone doesn’t help to achieve better results. 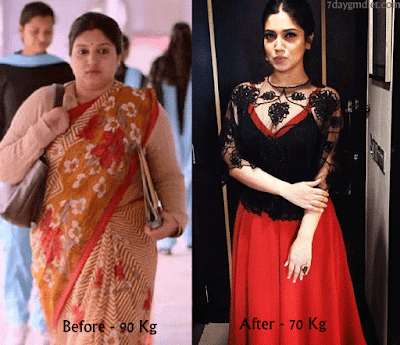 So, Bhumi has incorporated different exercises like Cardio, weight training, sports and dancing as part of her workout regime to get quicker weight loss results. First thing in the morning, Bhumi starts with a morning walk, followed by a sprint. At the noon, she visits the GYM, where she does cardio exercises for 15 minutes, followed by 40 minutes of weight training. Occasionally, she shifts to functional training instead of weight training. Apart from these, Bhumi also indulges in various sports activities like Badminton, Volleyball and swimming to maintain her weight loss momentum. Whenever in a great mood, the Dum Laga Ke Haisha actress dances to her favorite Bollywood songs, which is also a good exercise to burn calories. Isn’t the weight loss story of Bhumi Pednekar, an inspiration to many? If you too want to look fabulous, do follow a healthy lifestyle like her and lose weight naturally. Never follow any medications to lose weight, as it possess several side effects that hinder your health.